On a hot day in late March, the bees step out for some fresh air and dancing. 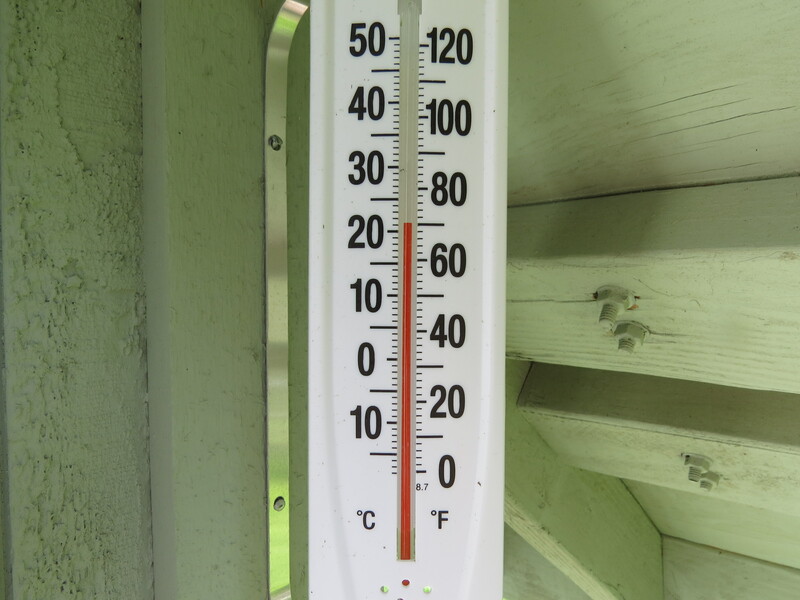 It’s unusably warm on the Oregon Coast today. The lower bee has been fanning for awhile. While I was photographing, this other bee came out and fed her? I don’t know if that’s what it is, but from here, that’s what it looked like. 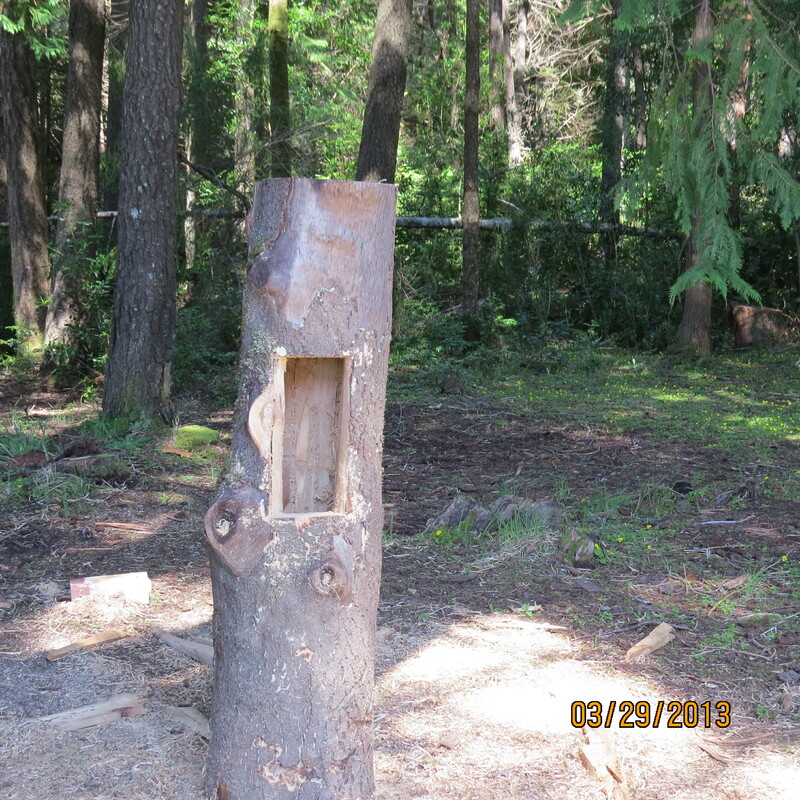 Pat’s next log hive progresses…much work still to be done before ready for bees. This hive swarmed the next day. I missed the prime swarm but got the second swarm into a back-up Warre. Swarm number 4 went into a tree hive. Swarm #3 got mixed into swarm #5 that went into Bee-atrice log hive. Looks like the bee is being fed to me too. Sweet. I love the log hives! Very creative. I didn’t know bees would stay outside the hive after dark. Amazing! Actually, bees can fly on a warm moonlit night says my smart wife who is reading the Biology of the Honey Bee, by Mark L. Winston. Very nice video! You did a great job filming the swaggle dancers. 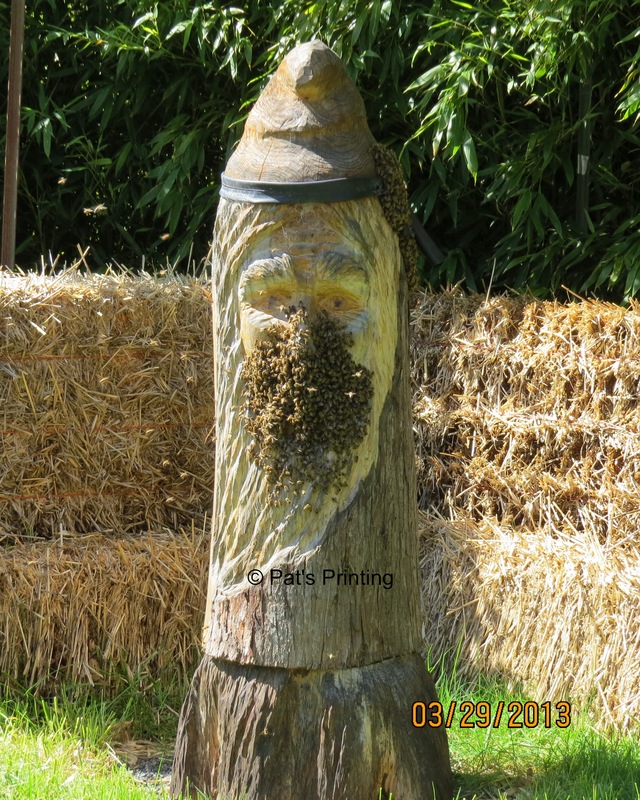 What kind of face will you have carved on the second log hive? Mrs. Claus? I don’t exactly know yet. After looking at hundreds of google images, quite a few Native American totems, and considering a few off beat suggestions, I still like the wood spirit the best. Ultimately, it’ll be in the hands of the carver who is coming on Thursday next. Footnote…had a swarm today. I didn’t see it emerge from Bee Beard, but the bees are not on the outside anymore. They alighted in a nearby tree, about 40-50 feet up, stayed about 1/2 hour and then vanished. I wasn’t able to find… how big is the cavity? If what we see is what they get, I think you’ll see lots of swarms. The cavity was 32 liters when I got the notion to get a face carved on it. I didn’t want to take a chance of ruining the carving so I stopped hollowing it out. The goal of the log hive was to provide a natural place for the bees to live without too much human intervention, grow as many bee-loving plants for habitat, and not take any honey. If they got through the winter and threw a swarm, I’d consider it a success. Maybe it’s just beginner’s luck, but I am happy with the outcome. Now I’ll wait about a week and listen for the next queen piping…I’d love to get that on a video. I spent all weekend trying to smooth out the next log hive’s chainsaw grooves. 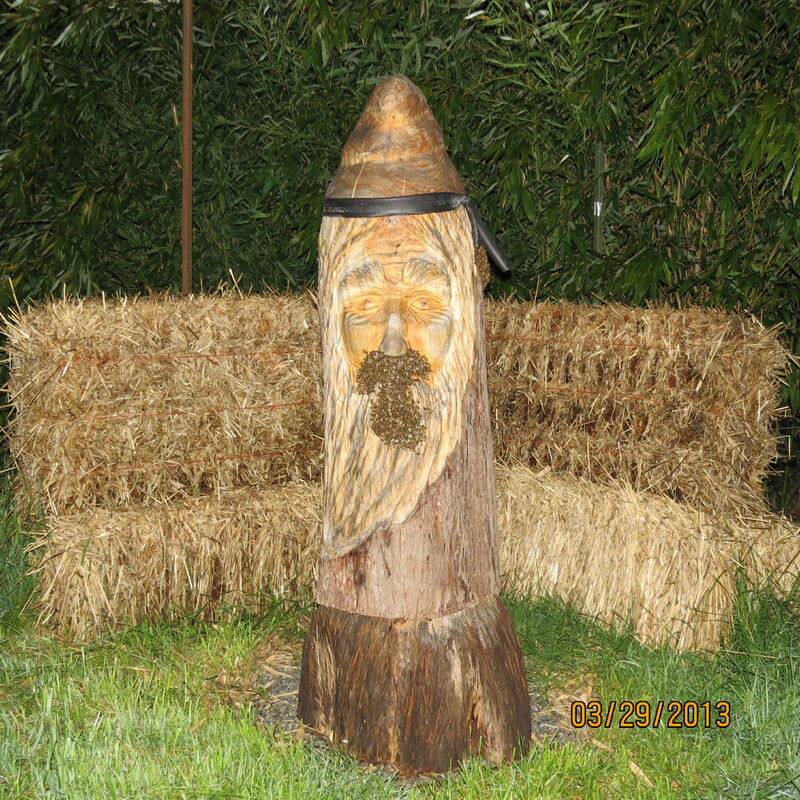 I hope I left enough wood for the Brian Vorwaller, the wood carver. My wife thinks it’s a little thin. I hope not. I emailed the suggestions to the wood carver’s wife. She said he is interested in creating a female version of the Bee Beard look. Maybe Bee Beard will get a girl friend. I like the idea of creating a swarm thrower, especially of ferals — these were bee tree bees, correct? But I worry about the success of small swarms. The second tree in this post is where the bees came from for Bee Beard. You can see my bait box hung right on the tree. Actually, I caught bees in both boxes. I gave the top one away after having all the excitement of transferring bees to the log hive. Hey HB…you were right about the swarms. We’ve had four of them already. We captured two, but missed the prime swarm. So far they are staying. I just love the idea of these logs, basically letting the bees get on with the business of being bees (er, say that three times fast!). 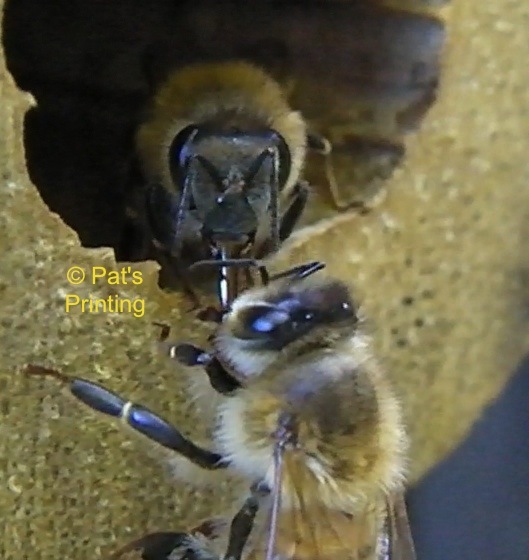 We have never been in it for the honey, just love watching them go about their daily routines. Good stuff! When I tell people I’m caring for bees, they always ask me if I’m going to sell the honey…I want to yell at them…”it’s not about the honey,” but I don’t. I just say that honey bees are in trouble, a third of our food comes from wild pollinators, most of which are honeybees, and if the bees are in trouble, by extension, WE are in trouble.